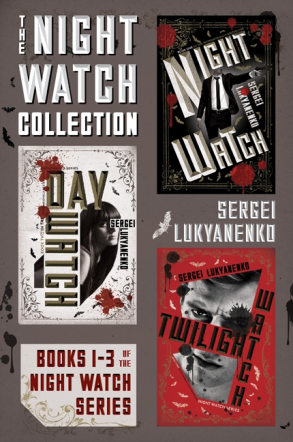 You can now download Sergei Lukyanenko's The Night Watch Collection, an omnibus edition comprised of the first three Night Watch books, for only 2.99$ here. Sergei Lukyaneko's first three books in his internationally bestselling Night Watch series—Night Watch, Day Watch, and Twilight Watch—are now available for the first time in a single volume. This collection also includes an excerpt from the newest book in the series, New Watch. This epic saga chronicles the eternal war of the “Others,” an ancient race of humans with supernatural powers who must swear allegiance to either the Dark or the Light. The agents of the Dark – the Night Watch – oversee nocturnal activity, while the agents of the Light keep watch over the day. For a thousand years both sides have maintained a precarious balance of power, but an ancient prophecy has decreed that a supreme Other will one day emerge, threatening to tip the scales. Now, that day has arrived. When a mid-level Night Watch agent named Anton stumbles upon a cursed young woman – an uninitiated Other with magnificent potential – both sides prepare for a battle that could lay waste to the entire city, possible the world. With language that throbs like darkly humorous hard-rock lyrics about blood and power, freedom and responsibility, Night Watch is a chilling, cutting-edge thriller, a pulse-pounding ride of fusion fiction that will leave you breathless for the next instalment.